Audio Pro Blue Diamond V3 - With its elegant design and high-gloss finish, the Blue Diamond V3 will receive a warm welcome in any living room in any home. 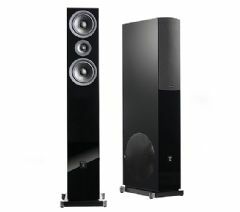 The loudspeaker is a delicate fusion between the purity of Black Diamond V3 and the deep bass of the ace-bass subwoofer B1.40. Blue Diamond has its given place in a serious hifi or home theater system, because there is no need for an additional subwoofer. The built-in subwoofer takes care of both your front channel’s bass and the dedicated subwoofer channel in 5.1 digital sound through the separate line-in input and the adjustable volume level.